applications for this Gorkhas Recruitment rally will starts from 16-11-2017 and last date for submission of online form is 14-01-2018. Recruitment Rally will be conducted at GRD Ground GHOOM, Darjeeling on 30-01-2018 and 31-01-2018. Candidates who are applied online they are only eligible for attend the recruitment rally. GHOOM recruitment rally will be held for recruiting the candidates of Gorkhas for the vacancies of Soldier Trades, Technical and Non Technical, Nursing Assistant Jobs. 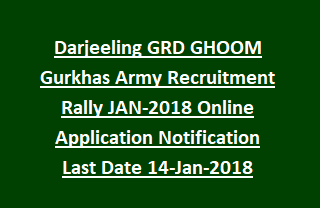 More details about this Gorkhas Recruitment Rally @GHOOM details are given below. There are plenty of vacancies in Indian Army. Candidates selection will be held in 5 stages. Fill all the details and submit the application form online on or before 14-01-2018.